Zadro LEDV410, Surround Light, Battery Powered, LED Lighted, 7-1/4″ Diameter Round, 1X and 10X Magnifying Table Top Vanity Makeup Mirror in a Satin Nickel Finish. Cuccio Milk & Honey Butter Babies. New! Milk & Honey Butter Babies are perfect for on-the-go in a travel friendly 1.5 oz. size! A perfect way to try Cuccio Naturale Butter Blends. Next Generation LED Lighted 1X/10X Mirror. No Power Cord Needed. Battery Operated. Lifetime “Eco-Friendly” LED Bulbs Never Need Replacing. Satin Nickel Finish. This high quality mirror has an ultra thin design. It offers the function of LED surround light and the convenience of cordless battery power. The mirror rotates full 360 degrees with no cords to restrict the movement. 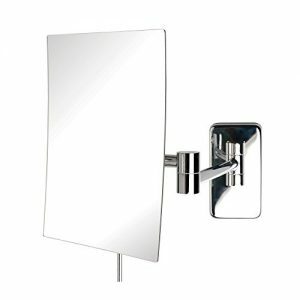 It is dual sided, with the 10-time magnifying mirror on one side and the true view mirror on the other side. On/Off Switch. Uses four “C” Batteries (not included). Batteries will last for one to two years with regular use. 360 Degree Swivel. Cordless – take it anywhere in the house. External Power Adapter included if you don’t want to use batteries. Unit Size: 11″ W x 18″ H. Mirror size: 7-1/4″ Diameter.